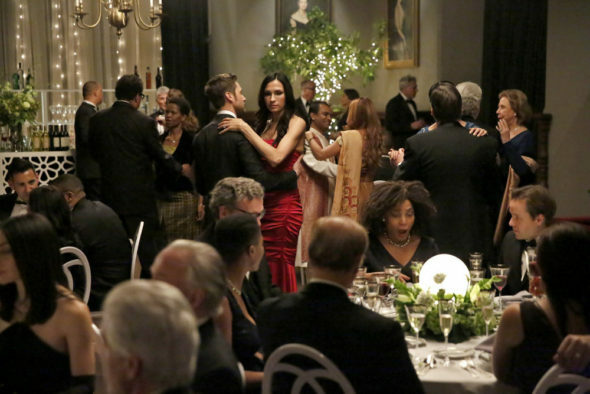 Can the Grey Matters operatives finally redeem themselves? Has The Blacklist: Redemption TV show been cancelled or renewed for a second season on NBC? The television vulture is watching for the latest cancellation and renewal news, so this page is the place to track the status of The Blacklist: Redemption season two. Bookmark it, or subscribe for the latest updates. Remember, the television vulture is watching your shows. Are you? Airing on the NBC television network, The Blacklist: Redemption stars Ryan Eggold, Famke Janssen, Edi Gathegi, Tawny Cypress, and Adrian Martinez. Terry O’Quinn recurs. A crime drama action thriller, this spin-off of The Blacklist features the slipperiest offenders from Red’s (James Spader) notorious list. Howard Hargrave (O’Quinn) founded Halcyon Aegis. Now his son, Blacklist undercover operative Thomas “Tom” Keen (Eggold), has joined Halcyon Aegis’ Grey Matters branch, led by the brilliant Susan “Scottie” Hargrave (Janssen). The unit also includes assassin Matias Solomon (Gathegi) and mercenary Nez Rowan (Tawny Cypress), as well as cyber hacker Dumont (Martinez). Out to redeem themselves for their past sins, the team tackles seemingly insurmountable predicaments that even governments won’t. Will their new, daring missions finally help these tortured creatures save their souls? The first season of The Blacklist: Redemption averaged a 0.76 rating in the 18-49 demographic and 4.04 million viewers. Find out how The Blacklist: Redemption stacks up against other NBC TV shows. On May 12, 2017, The Blacklist: Redemption was cancelled so there won’t be a second season. Could it be revived? Stay tuned for further updates. A spin-off of The Blacklist, this series premiered with pretty weak numbers and they haven’t exactly gotten better. While Redemption is a good bridge if the peacock network wants to break up The Blacklist next season, I think the ratings are too low to bring Redemption back for season two. 5/12 update: NBC has cancelled The Blacklist: Redemption after one short season. Details here. TV show ratings are still important. Follow The Blacklist: Redemption’s weekly ups and downs. Find more of The Blacklist: Redemption TV series news and other NBC TV show news. What do you think? Are you sorry that NBC has cancelled The Blacklist: Redemption TV show? Would you have watched a second season? The Blacklist: Cancelled or Renewed for Season Six on NBC? I THINK THEY SHOULD CONTINUE WITH SEASON 2 AND SO ON . We hope they will reconsider having a second season and more! Loved Blacklist Redemption. Good plot and actors.. BRING IT BACK. IT wasn’t fabulous show! What are you thinking NBC?? Definitely will watch season 2. This is one of the best shows on TV. Can’t wait to see what happens next. Big mistake if you cancel. Please renew for another season, for a spin-off they’re doing a great job…. Great proven characters, awesome team chemistry. This deserves another season hands down. Reminds me of a current day: Mission Impossible……. Definitely a Season 2 !!!! Between The Blacklist & Redemption you have 2 of the best show’s on TV by far !!! Yet you allow a majority of garbage television to continue year after year !!!!! What’s wrong with you people ??? Do you ever actually watch the shows that you produce ???? !!!!!! IMHO, it is obvious that you don’t !!!!!!!!! would have happily watched series 2 .